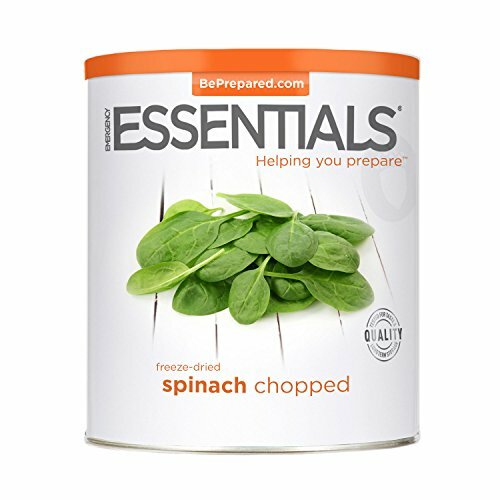 Emergency Essentials Freeze Dried Chopped Spinach - 6 oz by Provident Pantry at Kerinci. Hurry! Limited time offer. Offer valid only while supplies last. Our Emergency Essentials freeze dried chopped spinach is processed and packaged for long-term storage, so you can use it now or in the years ahead. Our Emergency Essentials freeze dried chopped spinach is processed and packaged for long-term storage, so you can use it now or in the years ahead. Add the natural goodness of leafy greens to your emergency food storage. Re-hydration restores much of the original flavor, color, shape, and texture. Fantastic for soups, pasta dishes, or any recipe that calls for spinach. An excellent source of vitamins A and C and a good source of calcium and iron. Ingredients: Chopped Spinach. No additives or preservatives. Allergens: Processed in a plant that also handles milk, wheat, egg, soybean, peanut and tree nut products Directions: Mix 1/2 cup of Freeze-Dried Spinach Chopped to 1 cup warm water. Let sit for 5 minutes and drain off excess liquid. Yields apx. 1/2 cup of Spinach for your favorite recipes. If you have any questions about this product by Provident Pantry, contact us by completing and submitting the form below. If you are looking for a specif part number, please include it with your message.